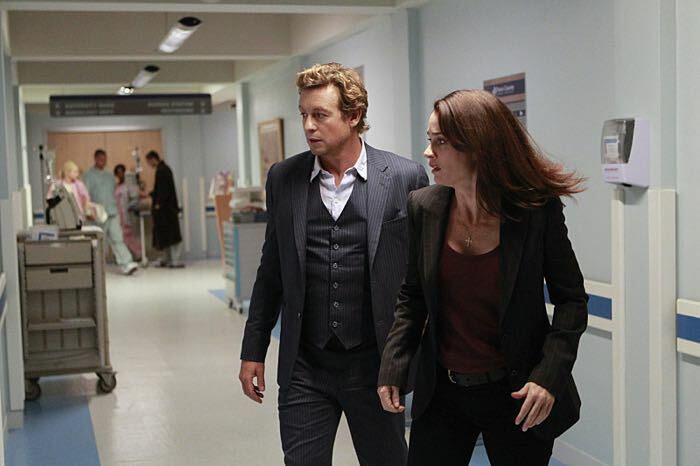 Read on for our recap of the new The Mentalist episode, Nothing Gold Can Stay. The FBI is called to investigate a gang of armored cars robbers. As the investigation goes on, Cho and Vega find the three men, and during a shooting, Vega is gravely injured, and she dies. The team later manages to arrest one of the three men, while the other two robbers die. Vega’s death is a shock for the whole team. For Cho, who saw her fading away in his arms. We rarely see an emotional Cho, but we could really see how much Vega’s death has affected him, especially since he is about to take over the unit. For Wylie, who had just asked her out, the two were just starting getting closer. After Vega’s funeral, Jane tells Lisbon that he can’t go on like this, that it could have been her in that coffin. That if he dies, it won’t hurt him, but he can’t go through losing the woman he loves a second time. He tells her he’s leaving, and that she can either go with him or stay. I want to talk about Vega first. While Michelle was introduced just this season, I learned to like her very much since the very beginning. Young, hard working, willing to learn from the team, even from Jane. Her death is, very simply, very sad. There’s just no other way to put it. While I know it serves the purpose of what it is potentially going to happen next, it is still very sad. You build a character, a strong one, a lovable one, to kill her off. While it might indeed serve the purpose, I just can’t get myself to like thise kind of things. I respect the choices made by the Writers, who are professionals who know what they are doing, but I personally still didn’t like this choice. Josie Loren was amazing portraying Vega, as were both Tim Kang and Joe Adler. Jane and Lisbon. At the beginning of the episode, they were planning a romantic weekend together, and now Jane wants to leave, for completely different reasons. As much as I can understand Jane’s motivations, his reaction left me sad and disappointed. True, Jane has suffered in a way it is hard to understand, I never for one second forger about that. But, he said to Lisbon he loved her, he wanted her to stay with him, and now it’s either you come with me, or you stay, but I’m leaving. These kind of ultimatums are the kind of things I don’t like, especially since Lisbon’s biggest fear was – is – seeing Jane leave her (again). If you love a person, you try to face the adversities together. Lisbon said in the previous episode, that she wanted them to be strong together. But Jane has always been very “selfish” in his pain. He thinks only he can understand. If he dies, it’s fine, because he won’t be there suffering… But what about Lisbon? Won’t she suffer? Isn’t she suffering right now too? In the very first episode of the Series, Jane says: “The truth is mine”. Now, it seems like he’s saying: “The pain is mine”. True, it is his pain, but he will never be able to ease that pain if he won’t start sharing it with the one he loves. The pain of losing his family will never go away, but it can be eased. With just three episodes to go before the end of the series, we’ll surely see Jane and Lisbon facing this situation, and try to find a way to live with it. Personally, I wouldn’t want to see Lisbon quitting her job, because it is either that, or Jane. Lisbon’s job is a major part of who she is, and why she is the person she is. Her desire to protect and comfort people. Wylie was straight in her arms when he needed comfort after Vega’s death. I really hope the current situation will evolve into a nice resolution for both Jane and Lisbon. Last mention to Robin Tunney and Simon Baker, who were absolutely breathtaking in that last scene.